I just wonder if Dermots Saturday shows are live now as the X-Factor has returned to grace our TV screens again? No they're not. They're recorded on Thursdays or Fridays, my informer tells me! He needs to be at Fountain, Wembley for rehearsals all day on X-Factory days. I guess like the normal years when I emailed the station a few weeks ago. They didn't no then. I guess like the normal years when I emailed him a few weeks ago. They didn't no then. He seems to regard Radio 2 as a part time job to be fitted in around other things he clearly sees as more worthy of his time. He said 'I'm not here today' after the first song yesterday plus something about Cher whatshername if I heard correctly. Don't know if this is the norm as I don't normally listen to him. Switched of just afterwards. Dermot was "lucky" to escape the witch-hunt a few years back that saw Liz Kershaw suspended. I know for a fact that he's committed the same sins as her but many more times - seems like half his shows are pre-recorded, but only recently has he admitted as much. I really do think a Saturday afternoon show should interact with the audience. Imagine if POTP read out e-mails of people failing to guess that week's Number 1 - much more fun. It's a shame no-one gets a chance to e-mail Dermot's guests as they can with , say, Ken Bruce's guests. What about those others who pre-record there shows. IE SOT60, Brian Matthews could come in on a Saturday and do a live show. It doesn't matter whether it's live or not. I love the way the shaved monkey said 'I'm not here!' re: his ever so important X-Factor duties! It reminded me of Robert Duncan as Gus in 'Drop The Dead Donkey' when he wanted the Globelink staff to carry on regardless of him taking notes. No its not live, in the first few minutes (before I switched it off) he said it wasn't so don't text. I can't see any reason why the format of SOT60s should require BM to present the show live to air. It's an entirely different production style to a show like Dermot O'Leary's and is produced in a different way. Dermot's is pre-recorded for the obvious reason that he's needed elsewhere at weekends between now and Christmas, and this will be in his contract that he can do so. However, his show - which I believe is recorded either on a Thursday or Friday of the same week - will largely be recorded "as live" - that is, from top to bottom only allowing for News and promotion breaks. However, SOTS doesn't even need to be recorded this way. BM could, if he chose, simply come in to a production studio, sit in front of a mic and lay down his links whilst referring to a script and running order. He doesn't even need to record "as live". The same could be said of Pick of The Pops - Dale could do it the same way (I often suspect that he does though can't be sure). I think they use ProTools in production, so it would be simple case of dragging and dropping links and music into the timeline and tweaking them a bit. However, there's much to be said for recording as live because it adds to the sense of pace and rhythm that the presenter can get when they're listening to the tracks they're describing and introducing. It isn't by any means necessary for progs like SOTS and POTPs, though, but it would be much more time-consuming to piece together Dermot's show this way. It's easier to record as live with maybe one or two retakes and trims here and there. Dermot's is pre-recorded for the obvious reason that he's needed elsewhere at weekends between now and Christmas, and this will be in his contract that he can do so. He's been doing it waaaaay before he started on X-Factor. On at least one occassion he has pre-recorded a show because he's gone to a mate's wedding but still asked for texts and e-mails to be sent in - which members of the production team then created. He also has the brass neck to endorse an album of live sessions on commercial stations - it doesn't say if any of them do 'A Nation Once Again' or 'The Sash My Father Wore' (Dermot was waving his Irish Nationalist flag rather too much the week he sat in for Ken Bruce). I've no objection to shows being pre-recorded, it makes a change not to have tons of texts read out. It means I get to listen to a presenter's thoughts not those of sometimes mindless listeners. It's the scarf my father wore!" taken from sessions on the show. I don't get to hear it very often. Dermot is not the clearest of radio presenters and you could say he's too chummy with everyone - that's just how he is I think. At least you can't accuse him of shouting. His persona and looks have made him a natural for television - my wife likes him - and the word seems to be that he's shortly off to America to host Simon Cowell's X-Factor over there, so I suspect that his extra-curricular radio hobby days might be numbered. It is the one relatively "young" and contemporary show in a day when those at the blunt end of the station's audience are well cared for. I'll let someone else speculate who might fill his boots at the helm. That's definitely one for Chris Evans who, I'm sure, has a bit of spare time. The BBC needs to get their money's worth out of him, after all. I know about rather than much older, for a few hours on a Saturday after 60's and POTP it's a jolt up to date. Some of the bands he champions are maybe a little bit new for the daytime playlist. Why do people constantly make excuses for them! Apart from Dermot who has a job to do on Saturday Night with X-Factor, if you call it a job . It looks easy until things go wrong in front of millions of viewers. Then it's a job that I wouldn't want for all the tea in China. Interacting? Does that mean reading emails and texts? I think I'd prefer most presenters to pre-record, in that case. I'm fed up with the so-called "interactive" input from listeners! I tried to listen to his show today, its no better and he said that 'we' weren't old enough to go to concerts in the 80s, what age groupo does he think listen to R2 ? 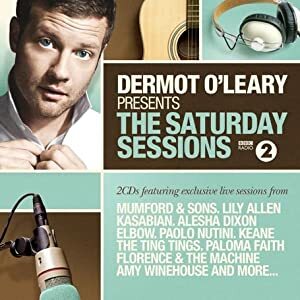 Dermot gabbles on a bit sometimes, and he can be difficult to hear sometimes, but I guess it makes a change from other radio 2 shows in which we're shouted at and treated like kids by the presenter! Perhaps Dermot could do the 6.30-9.30am weekdays slot? Sorry AgProv! I still think he's got a brass neck to flog the compilation on another channel. It's like 'Peter Griffin Presents The King & I, A Peter Griffin Production' in the Family Guy episode where Peter disrupts the Quahog Community Players's show which Lois is meant to be directing! Dermot will be taking 5 weeks off from the 5th November and Zoe Ball is covering. I can see her getting the show, with Richard Madeley taking over Zoe weekend show. My ambivalence knows no bounds! I can see Zoe taking over Richard's slot and then Richard taking over Dermot's after Zoe has finished covering for Bob Harris next February. Bob will, of course, be covering for Mike Harding when he moves to breakfast in order to present the new "Morning Mike Club". So would Johnnie Walker, who did the original one for Radio One as it happens. As Johnnie mentioned last night during his live stand-up show!! I heard the whole DO Show this week while working on the house and apart from a little too much waffle I thought it was ok. Some of the music was really good. I suppose it will come to head if Dermot signs for X-Factor US, then that would probarly be it at Radio 2. Thats clever of Dermot asking for listeners to follow him on twitter whilst he's not live. Why? David Dimpleby does it on Question Time and that's not live either. Very gay afternoon listening to Gok wan and Dermot. He was making Dermot blush.